All the week-end has been under the banner of Moët & Chandon. I arrive in Chateau de Sarran, the castle of Moët & Chandon, whose function is to receive guests of this house of champagne. 11 rooms are offered to the friends of Jean Berchon for the night. My Mercedes 600 is urged to leave the place in front of the door, which will be attributed to Ferrari, as Ferrari offered to Enrico Bernardo (best world sommelier) to come to this Chateau ( # 100 miles drive from Paris) with one of their cars. Needless to say that jealous as I am, I would be able to say good words on Moët for less than that (joke). The castle offers a view on the landscape on more than 30 miles. The vicinity was the way that armies took when invading France. In the dining room, a British table of mahogany for more than 30 persons is an appeal for the most elegant dinners. My room is deliciously decorated, and from my window I see a cedar of certainly more than 300 years. We take a bus to go in a big room where the ‘Ordre des Coteaux de Champagne’ will designate candidates to become chevalier, officier or grand officier. Many friends of Moët, big customers, foreign amateurs will be decorated with a medal and receive a diploma. This is of course something commercial, but it is made with elegance. The president (Commandeur) of the “Ordre” is a representative of Taittinger. He will say very nice words to me when I am named Chevalier. I am named at the same time as Richard Geoffroy, which pleases me as he is the man who creates Dom Pérignon, and has become chief oenologist of the whole group Moët. We drink Moët 1999 delicious, and some of the champagnes of the members of the ‘Ordre’. Then through the caves, we go to a very large cellar which will accept 300 people for a dinner, whose name is “cellar Napoleon”, as Napoleon was a school friend of Jean Remy Moët (it is why the champagne is named Brut Impérial). The menu was absolutely delicious. Médaillons de homard, vinaigrette balsamique, crème légère de fenouil / Osso bucco de lotte, caviar d’Aquitaine, fondue de poireaux / Filet mignon de veau à la truffe noire et sa poêlée de champignons / dacquoise aux noix, sauce aux épices chinoises. The Ruinart Blanc de Blancs served in magnums is absolutely delicious. Very easy to drink. The Delamotte Blanc de Blancs is highly expressive. I love this champagne. The Moët & Chandon rosé 1990 does not impress me as the Dom Pérignon rosé 1990 (remember that I did not get a Ferrari) (joke). With the rosé meat, it is delicious. But I have been impressed that it went so well with the mushrooms. I was sitting next to the ‘Commandeur’ who explained to me the reason he had to create the Taittinger Nocturne Sec, a champagne dosed with 19 gram of cane sugar per litre. So, largely sweeter than normal champagne it is a champagne for the last part of the night. It was delicious, but the dessert, too sugared, did not help the champagne to shine as it should have done. I had in front of me the president of Moët, Frédéric Cuménal, and next to me the former President, Yves Benard. So, we had passionate talks. I was asked to say a few words at the end of the dinner making comments on wine and food. I felt it as an honour as the only two who talked were Enrico Bernardo and me in front of such a great group of people. I congratulated the chef. I mentioned that a sugared dessert was a bad choice for the Taittinger. So, after the dinner, everyone mocked me, saying that with that remark, I would be banned by the Commandeur ! We went back to the castle where Dom Pérignon 1998 in magnums was waiting for us. Passionate and relaxed talks up to 2:30 am, finishing with a Paradis Cognac Hennessy. Taking my breakfast in my room with porcelains designed by Bernardaud, named “Eugenie de Montijo” with a lovely pink romantism, this helps to see life positively. By a sign of fate, a Ferrari was proposed to me to go back to the head office of Moët. 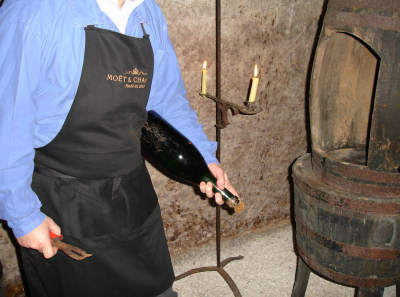 A nice film on Moët, very artistic, a trip underground with a lovely guide, Karine, and then I amoenotheque of Moët. In large cases of concrete, many bottles standing head down, of one year per case. 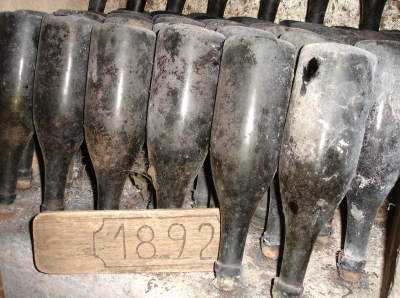 I was nearly collapsing with pleasure to see such a dream : 25 bottles of 1892 or 28 bottles of 1915, and so on. I was largely less impressed by this special assembling of the best years of the last century, which produced “only” 323 bottles. Moët 1999 : very precise and lovely champagne (I have driven the Ferrari) with the typical signature of Moët made of smoked and caramel taste. A really elegant champagne. Moët 1983 : many signs are absolutely lovely. I was a little annoyed by a trace of metallic tastes. As Richard Geoffroy talked only of years and not name, I asked if we were tasting Dom Pérignon and Richard answered to me that I should grow up to be allowed to taste the Dom (this is a joke as he intends that we make a private tasting as this one was organised for many people). The Moët & Chandon 1962 was disgorged in front of us. It took three tries to succeed. When I proposed to take the two unopened away to help them to keep the room clean I did not receive any approval. So I knew that these bottles were not lost for everyone. The 1962 is something fantastic. The smell was immediately of rose and of jam of rose. The taste was very floral and fruity. But what struck me, as a characteristic of this age, is the perfect integration of every component, which allows the champagne to be very long. The Moët & Chandon 1952 disgorged in the same instant is magnificent, and completely opposite to the 1962. The younger is a flower, the older is a pure wine. It is the exact definition of champagne. And this is incredible that such a difference can exist. But when sipping the two, I could see distinctly the signature of Moët, with obvious characteristics of smoke, caramel, sugared spiced bread. Then we had a lunch by the “orangerie” of the chateau, in a lovely “à la française” garden designed by Isabey, a French painter. We drank Moët Brut Imperial which I found lovely, a Phélan Ségur 1993 which was charming and tasty. Jean Berchon, with a great sense of hospitality offered me a glass of Richard of Hennessy a magnificent cognac made with some alcohols of 150 years. One of the greatest cognacs. When the noise of some 12 cylinders covered our farewell words, we knew that we had spent a lovely week-end, due to the generosity of a wonderful house of champagne. Cette entrée a été publiée dans vins et vignerons le 9 avril 2006 par François Audouze.